The sunset can play with a variety of shapes and colors here. My skylight is the best place to watch it and I love the view from my hill. For et fargespekter, - vakkert! WOW!!! Superhärlig och fin himmelsk bild! Så fint det är ! Och bilden är underbar !! Ljuvlig bild med underbara färger och fina kontraster! Du kan du, Randi! absolutt himmelsk med fuglen mot en frgestrålende himmel. Ha en fin torsdag og en deilig sommer. Fantastisk vakre farger i himmelen mot de flotte sihuettene! Masse flotte bilder du har her på bloggen din! So beautiful!Love the bird silhouette. That is an awesome view! Love the dramatic colors, Randi, and what superb capture! The bird in flight is the perfect accent! Have a great weekend! Nydelige farger på himmelen din. Så flott å se dette! Ha en fin fredda'! WOW! Awesome, this colors and the bird in the right moment. You have such fantastic skies! Wow, that's an amazing view from your room. I have a skylight but in the summer it's partly shaded however, I enjoy it in the winter when the leaves are off the oak trees. Wow!! 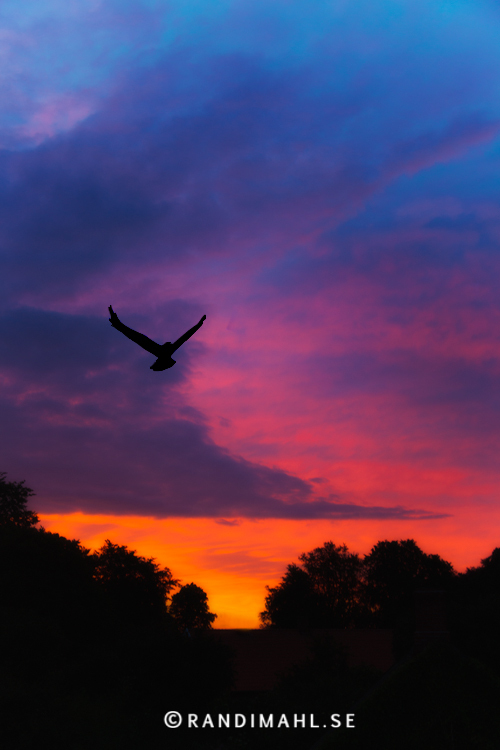 Such vibrant colours, and I just love the bird silhouetted against those clouds!! My mother loved the photo of the peony with the moon! Thank you again! WOW, amazing capture of colors. I love the bird and your beautiful sky. Well done, Randi! Happy skywatching! Those colors are absolutely spectacular, and capturing that magnificent bird in flight is icing on the cake! What a great photo - I can't take my eyes off it (and they would have been glued to that sunset until it got dark!) What a wonderful view you have! Beautiful colors in this photo!! Randi, I envy you having a view like this:)WOW!! !Fantastic shot.Have a great weekend!